This was our first venture in Switzerland out of Basel. The aim was to go to the Matterhorn Glacier Paradise (Klein Matterhorn). The Matterhorn is viewed in Switzerland with the same reverence as the Eiffel tower in Paris. That is probably because of the shape of the Matterhorn - pointy, taller than all other nearby mountains, standing like the lone victorious warrior in a battleground. At the Matterhorn Glacier Paradise, an elevator through the mountain transports visitors to the highest viewing platform of the Alps at 3883 meters above sea level. The platform offers a beautiful panoramic view of the Alps. However the weather was not that great, and we had started late on our trip. So we were not sure whether we can make it to the top and even if we did, whether we'll get a good view. 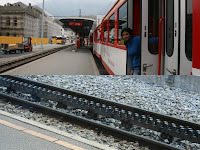 Our route was from Basel to Brig on Euro Rail, then from Brig to Zermatt on the mountain trains (Matterhorn Gotthard Bahn), and finally from Zermatt to Klein Matterhorn on cable car. The journey from Basel to Brig was very scenic. We reached Brig by 12 noon. At Brig we had to switch to the special mountain train that would take us to Zermatt. The mountain trains (Gotthard Bahn) had big clear glass windows, probably specially made to give a good view of the picturesque surroundings. But what really differentiated them was the narrow gauge rails and use of a 3rd special rail with cogs laid between the two regular rails. The cogged rail is engaged by a special cogged wheel under the train bogies and allows them to climb mountains at incredible angles and still have the grip and pull. 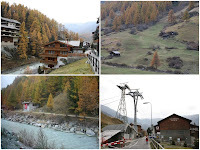 The path from Brig to Zermatt was through Visp, Stalden, St. Niklaus, Herbriggen, Randa and Tasch to Zermatt. 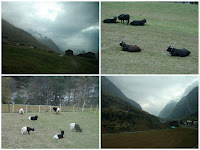 It was even more beautiful with lots of wooden houses, goats and cows grazing in the meadows and many streams and high bridges on the way. The house roofs used a typical stone like material to cover the house roof with, must be to prevent snow accumulation. All this while the Matterhorn was not visible at all, having been shadowed by heavy fog. We crossed the Herbriggen railway station, a small station on the mountain track at few minutes past 1:00 PM. Finally, we reached Zermatt at around 2 in the noon. Zermatt is a world without cars, cars driven by fossil fuels that is. Electric cars and horse-drawn carriages are however allowed. Emerging outside the station we found lots of match box shaped electric taxis. We were hungry like hounds and grabbed a Napoli and a Burger meal from a McDonald in one of the streets. At Zermatt we had to reach the cable car station for the next leg of our journey to Klein Matterhorn. By the time we started to walk towards the cable car station, it was already 2 in the afternoon. The walk was enjoyable. We saw an old Church tower, beautiful Swiss Chalets (wooden houses) lining the narrow streets. Some of the small houses were on short stilts! They reminded me of makeshift shops (cabins) people setup on road sides in my home town. :) Most of the chalets we saw were actually hotels. The small area around Zermatt features 36 mountains over 4000m from sea level. It is therefore a very popular base camp for both summer hikers and winter skiers. It has been used as a base camp to scale the nearby peaks from as early as 1820s and the first hotel in Zermatt is as old as 1838. As we walked out of the crowded town, the streets became more open and were pronouncedly white with a kind of white dust. Probably it was the chalk rich soil of Zermatt or may be it is because of all the granite dust resulting from the river carving through the rocks and all the construction activities going on around the town. By the time we reached the cable car station it was almost 3 in the afternoon. But the sky was so overcast that it looked as if it will become dark soon. The temperature was already minus 5 degrees centigrade. We could hardly see the Matterhorn from there. The lady at the cable car ticket counter advised us against going up to Klein Matterhorn as it was too misty and cold up there. It was the saddest moment of the journey, but it would have been a waste to go up unnecessarily. Instead we decided to walk around and see a bit more in Zermatt. We started off walking beyond the cable car station, up the hill. 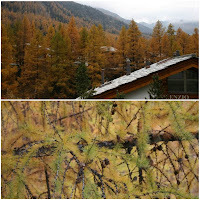 The path was lined with coniferous trees laden with cones. The Matterhorn was playing hide and seek behind the clouds, letting us have a hint of a glimpse for some brief moments. There were more houses and hotels and quite a bit of construction going on, most of them for building new houses. There was even an internet website design house probably catering mostly to local hotels and tourism related activities. There were a few interesting wooden artifacts on the road sides, sponsored by some of the hotels there. After walking around to our fill, we came back to the cable car station. Though it was just 4pm, it was dark and gloomy and threatening to rain. We freshened ourselves in the restroom at the cable car station, rested there for a short while before starting back towards the Zermatt station. We caught the next train back and munched on biscuits till we reached back in Basel. 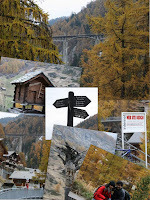 You can see some web cams of Zermatt and nearby places here, here and here. Below is the path we walked at Zermatt on Google Maps.